Figure 1. Acral blisters and erosions on the patient’s hand. Over two months, a woman developed nonpruritic blisters and fragile skin on the dorsal surfaces of her hands. These developed after commencing naproxen for arthritis. What is the most likely cause and differential diagnoses? Figure 1. Large blisters on the palm. A woman, post cardiac surgery, develops large blisters from urticarial lesions on her palms and soles after receiving vancomycin and ciprofloxacin for a postsurgical wound infection. What is the most likely diagnosis and differential diagnosis of drug-induced blisters? 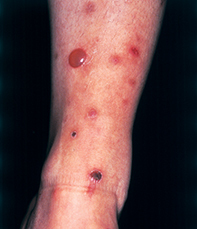 A woman presents with a two-week history of pruritic blisters, at various stages of evolution, over her limbs. What is the most likely diagnosis and the differential diagnosis? Figure 1. Sharply demarcated lesion with a cobblestone surface. Note surrounding sun damage, freckles and solar lentigines. 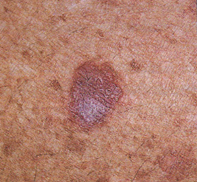 A 65-year-old man presents with a recently inflamed, dusky red-brown lesion on his chest that displayed multiple freckles and solar lentigines. A 54-year-old man presented with a longstanding, symmetrical, small, red papule on his thigh that had not grown and was asymptomatic. What is the differential diagnosis and what are the likely biopsy findings? A 58-year-old woman presents with atrophic and split fingernails, partially covered by a web of tissue. What is the differential diagnosis and how should the nails be treated? Figure 1. Irregularly shaped excoriation on the forehead. A 53-year-old woman presents with crawling sensations and an excoriation on her forehead. She brings a sample of the ‘parasites’ she says she has extracted from the lesion. What is this woman's condition and how should it be treated? Figure 1. Eroded plaque on the lower lip. 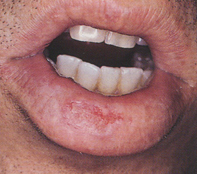 A 29-year-old man presents with a persistent eroded and indurated plaque on his lower lip which has not responded to topical treatments. What is the differential diagnosis and what is the next step in management? 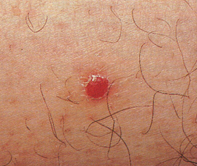 A 24-year-old man presents with progressive loss of his beard hair in patches. What is this condition and how should it be treated? Figure 1. Nodule with pustules on the index finger. A 23-year-old tropical fish fancier presents with a nodular lesion on his finger which has not responded to antibiotics. What is this lesion and how should it be treated?